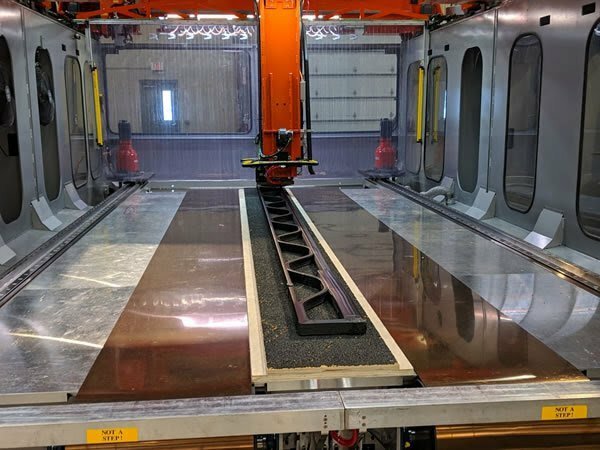 Thermwood has produced what could very well be the largest 3D printed autoclave tool for a helicopter ever made. 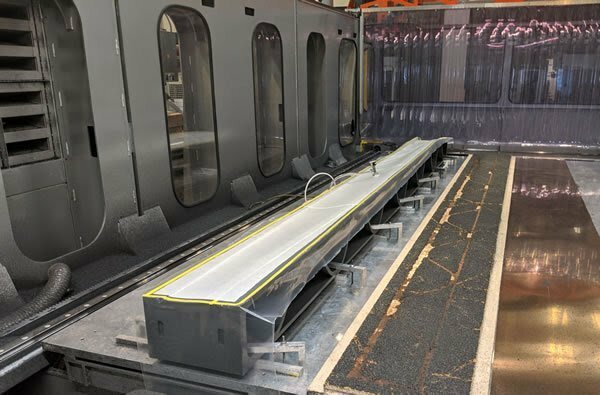 The project, realized through a partnership with aircraft manufacturer Bell, utilized Thermwood’s LSAM 60 mm melt core technology and reinforces AM’s applications in mold production. In the aerospace industry, long lead times for tooling present limitations and challenges in the development of new aircraft equipment. For this reason, Bell and other aircraft manufacturers have been eager to explore new opportunities for tooling. In Bell’s case, the company found its way to Thermwood, an expert in large-scale additive manufacturing solutions. 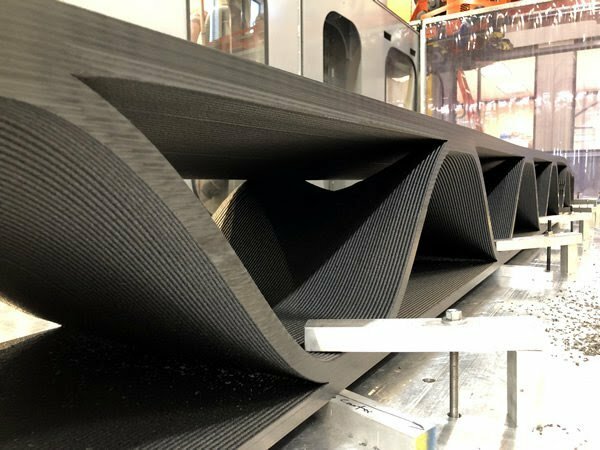 After discussing with Bell, the Thermwood team realized its LSAM 60 mm melt core technology could be a good fit for rapidly producing large bond tooling. Importantly, it believed its technology could produce a helicopter blade mold that would meet Bell’s tooling requirements. These included being printed in a single run for vacuum integrity, having a surface finish of 32 RMS or better, a resistance of 90 psi at 360°F and tight tolerances so that the two mold halves could fit together. The project undertaken by Thermwood was for a closed cavity blade mold measuring about 20 feet in length, 14 inches in width and 17 inches in height. The tool was printed using a 25% Carbon Fiber reinforced PESU material made by Techmer. The material in question was co-developed by Thermwood and Techmer for use with the former’s LSAM platform. The carbon fiber reinforced material has a number of qualities that make it well suited for tooling applications. For one, it has a Glass Transition Temperature of over 400°F and is easily able to withstand aerospace component cure cycles of up to 360°F at 90 psi. From a production perspective, the composite material is reportedly as easy to print with as ABS. Impressively, Thermwood says it was able to 3D print a whole half of the tool in just three hours and eight minutes. 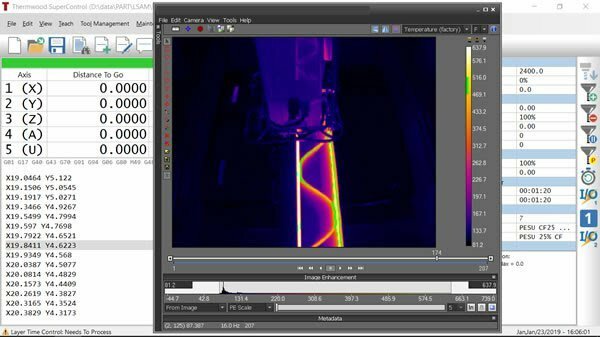 This was made possible thanks to Thermwood’s larger 60 mm melt core technology which was recently installed on its LSAM system at the Development/Demonstration Lab in Southern Indiana. The increased melt core capacity enabled the company to print the 542 lb part in record time. The 60 mm melt core has a maximum output of 480 to 570 lbs per hour (depending on the polymer used) and can print over 100 feet of typical print bead (.830 x .200 inches) per minute. This rate not only enabled the tool to be printed rapidly, but also enabled the print bead to be oriented along the length of the part, which helped to reduce thermal expansion. Thermwood’s “Continuous Cooling” print process also ensured that the cycle time for each layer was determined by the cooling time of the polymer used, which resulted in totally fused, void-free layers capable of maintaining vacuum in an autoclave without any additional coating. The tool also integrated an internal printed support structure which did not come into contact with the back side of the mold cavity. According to Thermwood, this was done to make sure that air could flow freely under the entire formed part in the autoclave, allowing for easier and more consistent part curing. The support structures used could not have been achieved using a more traditional manufacturing process and were reliant on the capabilities of AM. Once the mold was 3D printed, it was machined using another LSAM process. The LSAM system, which supports additive, trim and drilling processes, was able to machine the lower mold half in roughly 40 hours. When the part was complete, Bell found it met the vacuum standards requires for autoclave processing, without the need for an additional seal coating. Considering the success of the first mold half, Thermwood will go ahead to 3D print the second half of the blade mold. When that is complete, Bell will cure a full molded blade using the 3D printed bond tool—another exciting first for the aerospace sector that we look forward to. Thermwood and Bell will also conduct more tests on the PESU molds to validate the LSAM’s capacity to produce large-scale aerospace tools.